Whether you send this beautiful arrangement to the family home or to the service, all will appreciate its elegance and grace. The contrast of brilliant white blossoms and dazzling greenery create a wonderfully calm and dignified setting. 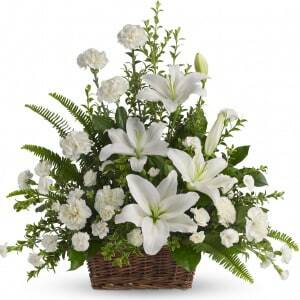 • Gorgeous flowers such as white lilies, carnations and miniature carnations mix with vibrant greens in a large basket. Simply stunning. 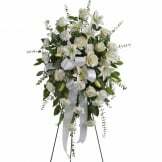 • Arrangement measures approximately 26" W X 25" H.
Flowers will be received by a K.L. Brown Funeral Homes' staff. I must say this arrangement was BEAUTIFUL! You did an exceptional job. I was so surprised and pleased with the quality of the arrangement. I never expected it to be as beautiful as it was and I thank you so much for how much love was put into it for the funeral that we attended. 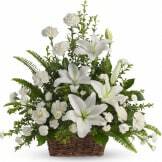 I received and e-mail of the order and then and e-mail when the arrangement was delivered to the funeral home. That communication was greatly appreciated. Receiving the e-mail relieved the stress of wondering if they would be delivered on time. Thank you again for making this sad time a little brighter. I recognized the basket right away because it looked exactly like what was advertised. The flowers were fresh and overall a beautiful arrangement. I asked for an American flag to be placed in the arrangement and was accommodated. Being from out of state, the convenience of placing the order on Funeral Home website worked to my advantage. I heard they were beautiful.So I'm pleased with purchase and want to Thank you. The basket of white lilies was beautiful! I was very pleased with the quality of the flowers and the display. Excellent service! I ordered the flowers online and the next morning they were delivered to the funeral home. The flowers delivered were beautiful and exactly like the flowers pictured online. Actually they were even more beautiful! Thank you for the excellent service! I was pleasantly surprised with the quality of this arrangement. It was exactly as presented in the picture and arrived on time. Thank you so much for excellent service at a time that it really counted. I was not able to attend the services but my husband did was and VERY pleased with White Lillie's Basket, iIt was so helpful as we did not know of any florist in that area. I am usually not too confident sending something "sight unseen" but was delighted that our choice was beautiful . Thank You! I was very pleased with the size and quality of my purchase. The Peaceful White Lilllies basket was beautiful and delivered on time. The transaction was simple and the flowers were beautiful. Completely satisfied. I liked the delieving time and price was a good and the flowers were fresh and beautiful. I would use the sympathy store again. and thank-you. I was impressed with the convenience of ordering such a beautiful floral arrangement for dear friends! Flowers where delivered on schedule.Feedback to me was that they were lovely. Transaction was easy online and completed Satisfactualy. It was beautiful, but looked just a little smaller than the picture. Very satisfied with the purchase. The flowers were exactly as they looked in the photo. Thank you. I was not able to attend my mother-in-law's funeral. I got the details on Saturday too late to contact my florist. I was able to get on the Sympathy Store web sight at 2:00AM and place my order. They were delivered on time for the service the next day. The convenience and quick delivery saved me from the embarrassment of late planning. I am sure the flowers were lovely. Thank you or your service at such an emotional time. The sympathy store was very helpful in making my choice because it was a same day delivery. It's wonderful to know that everything can be done in the same place. Keep up the good work. The basket was absolutely beautiful. The flowers were fresh and elegantly arranged. the basket was nice and looked good. thought it was a bit expensive for what was delivered. I supposed everything has gone up quite a bit. The basket was quite lovely and was priced well for the product. The order was placed on a Sunday and we were at sure they would think it to the Monday morning ceremony. They did! The flowers were beautiful. I highly recommend. Lovely and were delivered on time. This arrangement was beautiful! Exactly as pictured. I was told that the flowers were beautiful and were perfect for the funeral service. They arrived exactly when they were supposed to. basket was very beautiful, very nice job, delivered on time. It was so easy to pick a gift and process the order online, especially at the last minute. Thank you! this was simple and seems very professional. It was even more beautiful than the picture! Beautiful arrangement. Prompt delivery. Overall, very satisfied. Thank you . 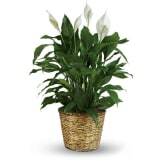 The White Lilies basket arrived when promised, and were stunning. 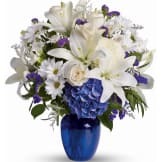 The family that we sent these condolence flowers to said they were beautiful and loved the fact they were bright and cheery at such a sad time. My cousin said the arrangement was beautiful. I was told the flower were beautiful! THANKS so much. This arrangement made the "statement" that I wanted to convey. It was elegant and very appropiate for the funeral of a very good friend's Mother. Beautiful arrangement for the occasion. It is good size, not too big or too small. Very peaceful and beautiful The price for this place was more reasonable than anywhere else for the same product. Thank you so much. The flowers were absolutely gorgeous, they were more beautiful than I had expected! Beautiful arrangement for expressing sympathy. Became the centerpiece used at the service. Thank you!!! She simply loved them. Did the job perfectly! The arrangement was just as pictured. The bouquet I ordered for my nieces funeral looked exactly the way I expected it to. I was really worried because I had a bad experience before with flowers I ordered from another source that didn't match at all and were below standard. This bouquet was beautiful and was delivered on time! I would use the Sympathy Store again without any reservation. The arrangement was absolutely beautiful! My sister who saw the flowers at the funeral home said she was so impressed with the flowers. So fresh that they almost didn't look real. She said it was the perfect flower arrangement for the passing of her mother-in-law who she loved dearly. She said her mom-in-law would have loved these flowers. I didn't see the arrangement in person but was told it was absolutely beautiful. This is my go to arrangement for sympathy occasions. I love the simple elegance of the all white arrangement with the greenery. Just a perfect arrangement. Picked this "online" based on the size & types of flowers. This was an Easter arrangement for my Mother and she sent me a picture. She said it by far was the most beautiful arrangement she had seen and the picture she sent was exactly, if not prettier, than the picture on the website. This arrangement was beautiful and very appropriate for a funeral. I did not attend the event, but the family contacted me and stated the arrangement was very nice. I've sent flowers from this site before and the pictures rarely capture how truly beautiful they are. This arrangement I picked for a funeral of a friend and it was so nice. I was happy that they had done a wonderful job. Beautiful! However, there was no card with this wonderful arrangement. The family was unable to thank the person that was so thoughtful. Unique and simple arrangement, perfect for remembering the loss of a loved one. The only negative was the florist didn't have the exact basket pictured, but the substituted basket was pretty similar. All of our flowers are designed and delivered by hand from a local florist in in Jacksonville.